Durations not given on release. For 1993 this was a high quality production and one of the first vinyls I bought (that led to almost 3000 more over the next 7 years). A nice acid trancer from Mr Wells, Chemical Warfare being the pick of the acid squidginess for me whilst Listen Up is more akin to FMM in "Panic" mode with a bouncier, lighter feel to it - actually quite smooth. D-Train is ok, but weakest on the EP for me, the vocal loop detracts from it in my opinion. Powers is a bit darker and meaningful with some lovely stabs and grinds. 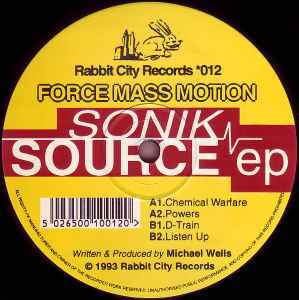 Overall, it's a very good EP that's sat in the shadow of "Escape" since the latter was released and I don't think that's entirely fair on Sonik Source.